Magic Shred - We Make Your Private Documents Disappear! Count on our mobile document shredding company in Denton, Texas, for the highest level of security for your paper shredding needs. 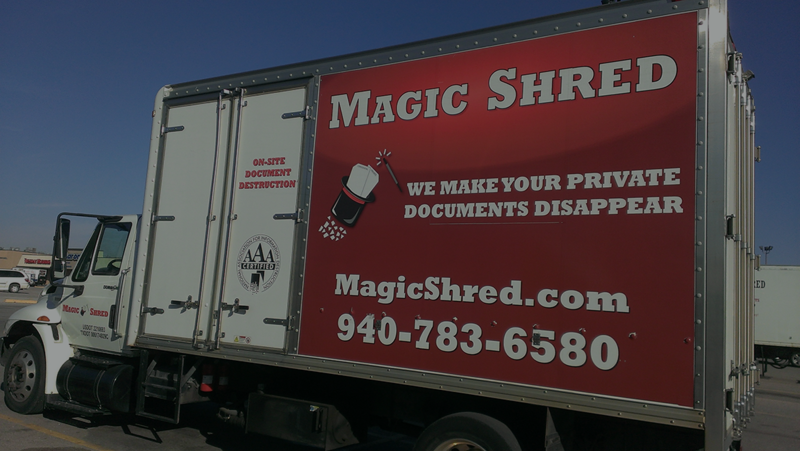 Magic Shred brings our services to you for convenience and confidentiality. Trust in our environmentally friendly company to provide you with the best services around. Your private documents disappear in no time with our shredding services. You receive a certificate of destruction upon completion of the job, and your destroyed documents are immediately taken to a recycler to be remade into new paper products. Guaranteed coverage and quality insurance- If you would like, we will have our insurance company fax over a certificate of insurance for your records. You no longer need to separate paper clips, staples, or clasps from your documents before they are shredded. Just drop off your materials into the slotted containers and we do the work for you! You receive secure, completely confidential paper disposal services from us.